We've got quite a few boxes packed with quite a few more left to go. I've got neat several crafty projects finished, but don't have the time to post about them at the moment because the house is a wreck and needs some attention. So instead I thought I'd share this beautry. Back in April, I wrote this post about going through my stash and listing out projects I thought I'd be doing soon. Christmas presents for my kids' birthmothers Finished, but still need to post about this one. Fixing the eye spy bags (the plastic windows tore) Finished, but still need to post about this one. 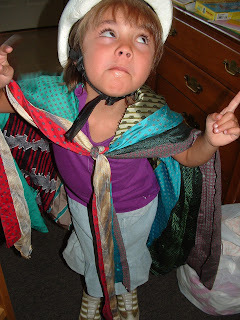 A box of free ties to make into Joseph's Coat of Many Colors for a Primary Lesson and some more of these toddler ties You get this post now! I took a bunch of old ties I got fro free, opened them up and took the insides out, then sewed them together. I left the two on each end long and the other ones are shorter. That way the ones on the end can be used to tie it around your neck. I thought about lining it and/or finishing off the edges, but then decided it was so ugly it wasn't really worth the time, especially since the kids love it as it is. It doesn't seem to be fraying much and the kids still have fun playing with it. I used it for a Primary lesson a while ago about Joseph in Egypt. 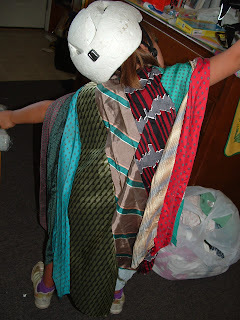 So if you've got a bunch of old ties lieing around and about 15 minutes, you can make one too! I love it, what a great idea! This is such a great idea! So cute and what fun to play with. At the thrift shore here (at rose villa) they have old ties for 10cents each, not free but a great price. Let me know if you ever want some. Haha - lots of old-ish ties at my house, but I don't think Mark will let me use them. :) Great project for the kids! So cute! My son loves the story of Joseph and knows the words to the musical by heart. He would adore this. I'd love to get ahold of some free ties. I can't seem to find them for less than $1 each at the thrift stores.